Cotehele - A Haunted Manor House. 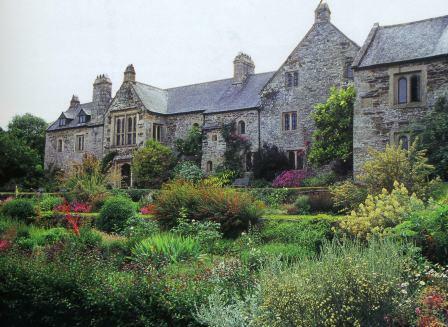 Constructed between 1485 and 1687 and little changed by the passage of time, Cotehele is blessed with a wonderfully intimate atmosphere. For centuries Cotehele was the home of the Edgcumbe family, and its solid stone-built rooms are testimony to their wealth and tastes. Rich tapestries, works of art, four poster beds and timeworn steps are to be found throughout the property. And once your eyes have feasted on the house’s many treasures, you can let your imagination run riot and attune yourself to the many mysteries that crackle within its ancient walls. Many visitors have commented upon the distinctive herbal fragrance that has been smelt all over the building. It is often accompanied by the sound of plaintive music, and occasionally hazy and indistinct figures are seen gliding about the house. In the past servants used to talk of a girl in a white dress who was repeatedly seen in certain rooms, although her identity remains a mystery to this day. Visitors who have no prior knowledge of the ghostly girl have also encountered her and have remained unaware that she is a ghost. Only when they have made enquires of the staff as to the identity of the young girl with the "long hair" in the "white, flimsy dress," do they realise that she is anything more than flesh and blood. In the past staff at the hall were known to answer such enquiries with a brief shrug of the shoulders and the re-assuring reply of "Oh don’t worry, you must have seen the ghost." The text and images on this website are the copyright (2002 - 2011) of Richard Jones. They may not be copied, stored or reproduced in any format without the express permission in writing of the copyright holder.